What Will Your First Day at the Police Academy Be Like? Starting out in any new career can bring a lot of mixed feelings. This is especially true for the thousands of police recruits across the country who report for their first day at the police academy. You're excited about learning new things, but you might be a little scared of the unknown, too. You won't be fully prepared for what the what the first day at the academy will bring, whether you've spent the last four years in college earning your degree in criminal justice or the last 20 years in a military career. But knowing what to expect on Day No. 1 as a police recruit can help. There will be yelling, and a lot of it. You'll probably be greeted by a group of instructors who mean business when you report. They'll bark commands at lightning speed, and it's easy to get confused and upset. Don't. Use your mind, think critically, and act accordingly. 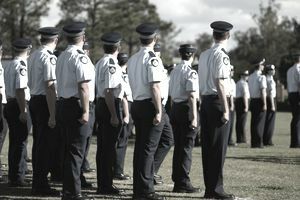 You and your new academy classmates will most likely be ordered to immediately get into formation and to do it quickly. Some of your fellow recruits will probably have prior military experience and they will respond immediately and without confusion. Your best bet is to find the spot where everyone is forming up and just fall in with them. Line up so you're even with the person to your right, an arm's length away. Come to the position of attention with your thumbs along the seams of your trousers, chin up, eyes forward and feet at a 45-degree angle. Don't move from this position unless and until you're told to do so. Don't look around and don't move your hands or head. And don't lock your knees. If you do, you'll faint...and you won't be the first one. Go in with the understanding that whatever you do is probably going to be wrong. Expect to be yelled at. Take it in stride and understand it for what it is: a way for the instructors to gain control and instill discipline quickly, efficiently, and effectively. There's no right answer if you're asked why you did whatever it was that drew the instructor's attention to you, so avoid the temptation to try to explain yourself. Any answers you give should be short and to the point. If you weren't raised in a home that required you to say "Yes, sir" and "No, sir," start getting used to saying it now. Officers are taught to treat everyone they encounter with the utmost respect, and that starts with addressing them as "sir" or "ma'am." Don't worry if you have a hard time remembering to do this. The instructors will be happy to remind you. If you're not in shape now, you're going to want to get there quickly—ideally before your first day at the academy. The instructors will shout and yell, but they won't ever hit you. You can expect to do plenty of pushups instead when a classmate screws up—and rest assured that someone will. When your arms get too tried to hold you in the front-leaning-rest position, turn on your back and do flutter kicks. These forms of physical exercise are a great way to instill both mental and physical discipline. They also teach you to push through pain and discomfort to accomplish a task, and this can help you survive a violent encounter when you get to the road. Take this part seriously right from the beginning. You can't graduate from the academy in some states without passing a physical fitness test. The test can include wall and fence climbing, sprinting, an obstacle course, and body drags. There will be plenty of forms to fill out as you get started, and you'll receive an introduction to the curriculum as well. You'll sign statements acknowledging that you've received your textbooks and that you're aware of what's expected of you. Read everything carefully because you'll be held accountable for all of it later. The academy isn't all about yelling, pushups and leg lifts. Important administrative matters must be attended to, and you'll learn about these things as well. Some states will also test your writing skills before graduation because what you'll ultimately be reporting at the end of the day can be critical to investigations. The academy will also teach you to write accurate reports. Eventually, well after Day No. 1, you'll get to the good stuff. You might learn combat fight techniques and how to deal with various weapons you'll meet up against over the course of your career. You'll become well versed in how to deal with many scenarios and you'll be taught proficiency with a firearm. There will be simulated arrests and emergencies. Remember, the police academy instructors aren't there to scare you away or to hurt you. Their goal is to get you ready for the tough career you've chosen. A day in the life of a police officer requires endurance, discipline, and a tough skin. Your first day at the academy and every one after that are designed to set you up for success and to help you realize your full potential as a police officer.